Swing Your Partner | Fit Families | Kids VT - small people, big ideas! Full disclosure: I love to contra dance. Years ago, I met the man who would become my husband on the dance floor; two years later, we had a delightful contra dance at our wedding reception. But now that kids are in the picture, I had to wonder: Is contra dancing a family activity? One recent Friday night, I ventured to the Edmunds Elementary School gym — alone — to find out. Inside, the room was buzzing with activity. On stage, a three-member band — featuring accordion, piano and dulcimer players — pounded out lively tunes. Driven by the beat, a long line of dancers moved up and down the room, spinning, turning and skipping. Like maple syrup and brilliant fall foliage, contra dancing, aka New England folk dance, is a regional specialty. Derived from both English country and French court dances, the style first appeared in 18th-century colonial New England. It's been evolving ever since, but its hallmarks remain: live music — jigs, reels and other traditional tunes with an infectious beat — and a caller who teaches each dance and then offers instruction and encouragement once it's under way. 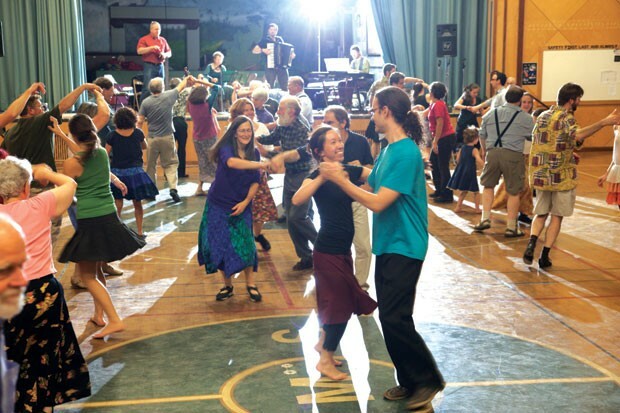 Most dances are done with partners, but there's a lot of switching around, making contra dancing a distinctly social activity. Dancers of all ages were on the floor at Edmunds. A charming 3-year-old boy named Willard danced in his mother's arms while a pair of 10-year-old girls twirled down the hall. In the dance line, high school students mingled with older folks. Something about the music and movement got everyone's toes tapping. Regardless of age, everyone was grinning. Willard's mom, Lianna Tennal, is a huge fan of contra dancing with kids. 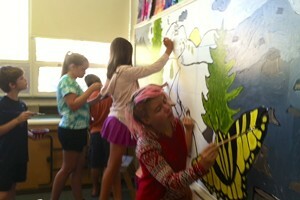 "It's something that I love, and I feel good about sharing it with them," Tennal told me. She brings her two children to dances in part for the community — "good, healthy people to hang out with," she says — and in part for the great music. She likes teaching her kids to translate that music into motion with their bodies. And she loves the positive energy. "It's great for families," she says. "There's so much smiling, a whole room full of people smiling at each other!" Tennal's 5-year-old daughter, Alice May, can handle the simpler partner dances without her mother's help. Willard still likes to be carried, or to hold his mom's hand, so they dance as one person. When I asked Alice May to identify her favorite thing about contra dancing, she lit up. "I like to dance a lot and spin around," she declared. "The music is so nice. It makes me feel happy!" Willard is fascinated by the instruments. He likes to hang out by the stage and watch the musicians. "I want to play the fiddle," he confided. The verdict? Next time, I'll bring the whole family. Comfortable clothes and soft-soled shoes, although some dancers prefer bare feet.